I have had the wonderful privilege of spending the past 30 summer/fall field seasons documenting right whales in the Bay of Fundy. The Bay has always been such an important feeding ground and nursery area for this species and is also an accessible habitat for us to do day trips out of Lubec, Maine on the R/V Nereid. So our anticipation of who and how many right whales we will see is always high at the outset of the season. This year we even had a competition of which right whale would be seen first this season - we each chose a whale based on their prior presence in BOF or our own personal affinity to the individual (not what we would call a scientifically valid endeavor!). 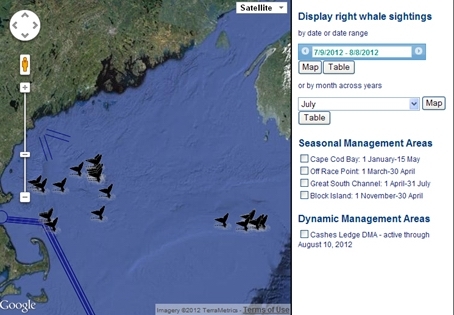 Alas, none of us have won this competition yet as the right whale sightings have been quite sparse so far this season. But the Bay always seems to surprise us with something amazing, and this year is no different. On August 19th, as we were photographing the handful of right whales we had found that day, we came across what looked like a lone right whale, and so collected our normal suite of photographs. I was one of the photographers on the bow that day and as we approached, I heard someone say "Wow, that whale looks really skinny," and then, "Geeze, that whale has no callosities!" Trying to see that through the camera viewfinder isn't so easy, but with the advent of digital cameras we now have the ability to review what we photographed instantly. As we scrolled through the images, we realized that what we had just photographed was not a right whale at all but instead was a bowhead whale (a close cousin to right whales)! This is a first for our 33 years of study in the Bay of Fundy! 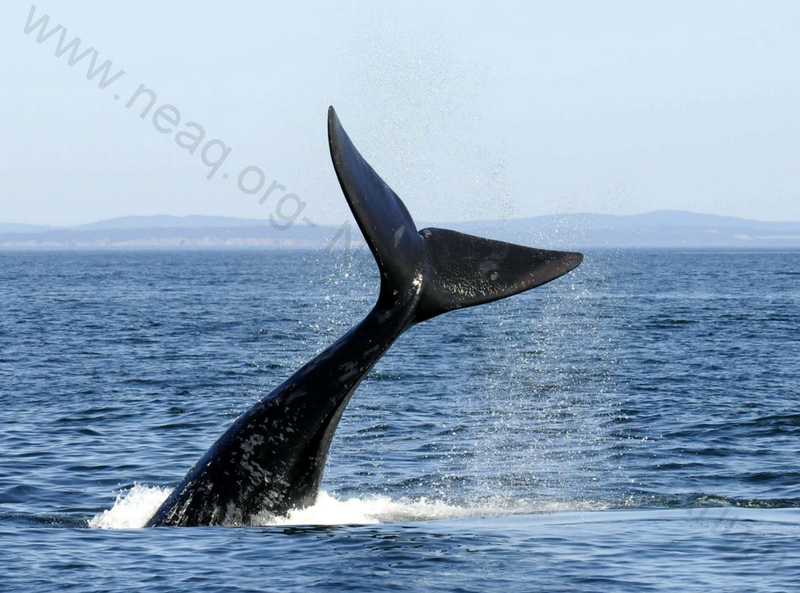 Interestingly, we were aware of an even more unusual bowhead sighting from this past March, when our colleagues at the Provincetown Center for Coastal Studies observed a bowhead in a surface active group of right whales off of Cape Cod, MA. Because of the novelty of their sighting and their plan to get that information published in a scientific journal, we decided to coordinate with them to see if we had sighted the same animal (which we had- the scars on the peduncle matched) and to let them send out a press release about both of our sightings. On August 28, The Boston Globe wrote a piece on the bowhead sightings. The Chronicle Herald out of Halifax, Canada, also wrote an article after a Nova Scotia whalewatch boat observed the bowhead the same week as our team did. The presence of an Arctic species in the Bay strikes us as incredibly odd in a year where water temperatures in the entire Gulf of Maine are at an all-time high. But it may be that this subadult animal is simply on a "walk-about" or just very lost. It is not that unusual to see an individual animal of a marine mammal species outside of their typical range. But it's important to continue documenting these cases of "stragglers," as if there are many stragglers that show up outside of their known range, this could be an indicator of changes in food availability elsewhere. 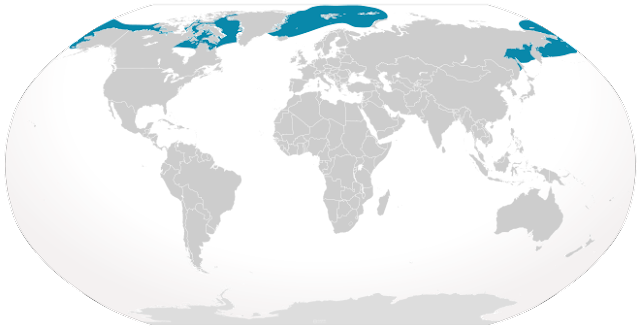 Typical range of the bowhead whale. This file is licensed under the Creative Commons Attribution 3.0 Unported License. Thanks to The Emirr for the map! With climate change occurring especially in the Arctic, we will continue to keep an eye out for any shifts that we witness in our long-term study of marine mammals in the Bay of Fundy. After seeing quite a few right whales on Monday, we had high hopes for a busy Day 3 out on the water on Tuesday. However (as we are already well aware of), our study species have a mind of their own, so naturally we only found five individual right whales. But what our survey lacked in quantity, the handful of whales we did see put on quite a show for us. The 2011 Calf of #1243 breaching sequence- these three photos span only one second! We spotted "Columbine" (Catalog #1408) several times throughout the day, which was exciting because she is an older female born in 1984 who has been a regular visitor to the Bay of Fundy over the last 28 years. She hadn't been observed here since September 2008, but is one of the first older whales to arrive this season. The NEAq team did photograph her during their 2011 winter survey near Jordan Basin in the Gulf of Maine, which is a potential right whale mating ground. With a beautiful dark black and robust body, Columbine looks healthy, which is encouraging to see in an ocean with changing environmental conditions and food distributions. Due to dedicated surveys and genetic analysis, we know she is the grandmother of #3808, the first right whale that we sighted in the Bay this season!! Our new favorite resident whale (the 2012 Calf of #3390) continued its streak of impressing its audience with what is known as a "curious approach." The calf (sans mom at this point), cautiously circled the Nereid, while playfully checking us out above and below the water. We made sure that we were shut down for the entirety of this behavior, as to not endanger our inquisitive young friend. Moments like this definitely bridge the gap between researcher and study subject: our similarities become more tangible when whales observe us with the same curiosity in which we study them. Without a doubt, this was one of the highlights of our day, let alone the season! It is also interesting to note that it wasn’t until we left the calf about a half hour later that we found its mom (Catalog #3390) at least a mile away. This is normal behavior for mom and calf pairs in the Bay of Fundy, as the calf is slowly weaned from its mother and the two begin to spend more time apart. As a first time mom, it looks like #3390 is off to a great start of what we hope will be a long period of her raising healthy calves. Towards the end of the day, the 2011 Calf of #1243 made sure we didn't motor past it by lobtailing energetically. Once it had our attention, the one year-old began a long series of breaches right off of our boat, intermixed with several bouts of flipper slapping and rolling. It is nice to see that the yearling found its way back to the Bay, since "Magic" (Catalog #1243) and this calf were one of our mom and calf pairs in the Bay of Fundy last year! We couldn’t have asked for a more entertaining sighting to finish off the day. Here’s to hoping the weather stays nice and that more whales continue to arrive in the days to come. Editor's Note: Kelsey joined us for her first Bay of Fundy field season last summer! 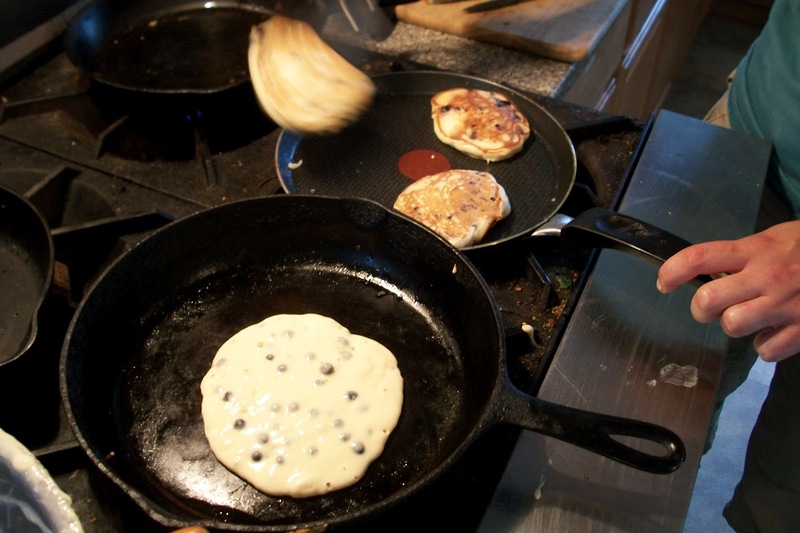 Read her previous posts from the 2011 season on taste-testing copepods and right whale gunshots! We had another good survey day yesterday- great visibility and calm seas- and found no right whales. The arrival date for right whales in the Bay of Fundy has changed quite a bit from past years to more recent years. In the 1990's, they frequently arrived in early July. In the 2000's, they reverted to what we think of as their usual pattern of arrival- early August, with a few appearing in late June or July. Even though we know the arrival date will vary, whenever we find few to no whales, we begin to wonder: Why aren't they in the Bay? If they're not in the Bay, then where are they? File photo: Kelsey Howe, taken on last day of BOF 2011 surveys. One thought about the first question is that the sea surface temperature has been quite a bit warmer this year- 58-59 degrees F compared to the more usual 46-52 degrees F. The plankton that right whales depend upon require specific conditions that may well have changed. Also, a recent study discovered dramatic reductions in phytoplankton in the Gulf of Maine in recent years. Phytoplankton, or plant plankton, is the very base of the food chain and is dinner for the copepods that right whales feed on. So with warmer water temperatures and reduced volume of phytoplankton, it's possible that there's been some shifts in the food resource for right whales- perhaps the copepods are available in a different location than usual, or at a slightly different time of year. Assuming that right whales are responding to these or other environmental variations, changes in their distributions may actually be a positive sign. It may be demonstrating their ability to adapt to what will likely be an increasingly changing environment. While some people still try to deny the evidence of climate change, animals around the world are already highlighting the environmental changes by altering their normal ranges--from birds and butterflies to whales. For example, are the conditions that have made the Bay of Fundy favorable to sperm whales in the last three years unfavorable for right whales? As to the second question of where the right whales may be, there are several possibilities. The NOAA's Northeast Fisheries Science Center's aerial surveys in July had right whales on the northen edge of George's Bank and near Cashes Ledge- all south of the Bay of Fundy (see map from their interactive web site below). There have been no recent surveys in those areas, so it is unknown if they are still there. We have also received several reports of right whales in the Gulf of St. Lawrence this summer--an area that seems to be important to some right whales but which has not been well surveyed. It's a big ocean and there are many other places that right whales could be. We hope that many will make their way to the Bay of Fundy soon, but wherever they are, we hope they are finding all the copepods they can eat! As researcher Philip Hamilton told us over dinner recently, being a whale biologist means you need to have the patience of a Buddhist monk and the adrenaline of a professional athlete. This mantra is applicable during our field season in several ways, two of which are when we are on the water looking for right whales, and when we are on land, checking for good weather days. Three wet, foggy days had passed by since our arrival, and it appeared as though a fourth day on land was in sight. Returning to Lubec after fueling the Nereid in Eastport, we are welcomed by a wall of fog. However, as it sometimes does, the weather forecast turned in our favor! 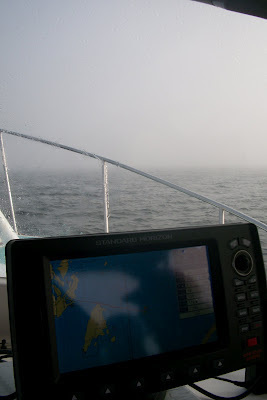 On Saturday, Philip woke us for a slightly later departure (7:00 AM off the dock) so that we could make sure we had the fog beat. And indeed, there were good survey conditions on the Bay despite some haze. We began our survey with few sightings, mostly consisting of harbor porpoise and seals. 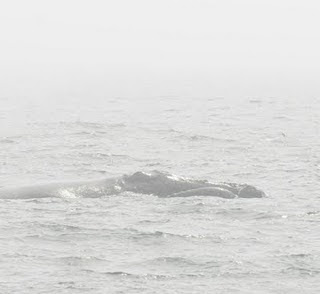 Around 11:00 AM at the southern end of our first trackline, we came across a humpback mother and calf pair! The calf appeared to be nursing- disappearing underneath its mother's body and popping up on the other side after a moment. Not long into our observation of the pair, the calf started flipper slapping and then breached several times! Breaching humpback calf. Photo by Meagan Moeyaert. An hour and a half later, we shut down the R/V Nereid so that we could have a ten minute listening station. During these ten minutes, the team scans the horizon in all directions and listens for whale blows. The highly visible spout that we use to identify large whales is created when water washes over and in a whale's blowhole(s). When the whale exhales, it gets sent up into the air in a certain way based on the blowhole configuration specific to the species. Having calm seas is fantastic for our work, but it can also make it difficult to sight those spouts since there's less water washing over the blowhole. Since large whales have such huge lungs, the sound of their inhales and exhales travels long distances, and we can often hear the whale without actually seeing the spout. As we were listening, Philip heard a whale and we discovered a sperm whale close to our vessel! Sperm whales have a single blowhole, located on the left side of their head- this makes them easy to identify because their blows appear angled. It was motionless at the surface, so we were able to observe it for a few minutes and take some photographs before it fluked on a terminal dive. This whale has a very distinct fluke with a scar around the notch and some chips out of the edges, so it will be easy to match it if we see it again. Having checked off several different species of marine mammals with no right whale sightings, our hopes were still very high that we would find what we were looking for. 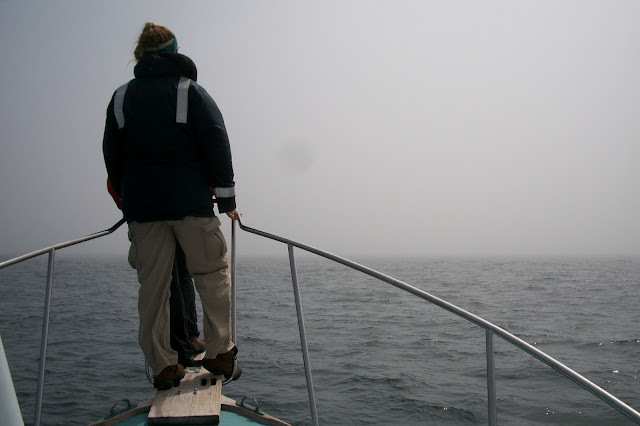 Amy and Philip were keeping watch on the bow when just after 3:00 PM, they sighted flukes. When we saw the characteristic V-shaped blow of a right whale, a cheer went up around the boat and everyone sprung into action with our adrenaline pumping. The whale was identified as Catalog #3808, a female born in 2008. She was playing in a seaweed patch- lazily rolling around, posturing (lifting head and tail out of the water at the same time), and popping up with seaweed on her head. #3808 was certainly charming and it would have been entertaining to observe her longer, but we left to continue our trackline and see what else was in the area. By the end of our 12-hour day on the water, our first survey of the season did leave us with some noteable large whale sightings, but with only one right whale. Now back in the office, we realize that #3808 has a very cool line of mothers that we can trace due to diligent survey efforts and genetic analysis. #3808 is the offspring of Catalog #1408, a whale named Columbine who was born in 1984. Columbine is the daughter of #1118, Zipper, who was born in 1977. Zipper is the daughter of Catalog #1007. This means that we can trace four generations of females, making #1007 a great-grandmother! Unfortunately, #1007 hasn't been seen since 1986 and so is presumed dead, but it's great to know that her great-granddaughter is looking healthy and has migrated safely to the Bay of Fundy. Hopefully, there will be some others joining her very soon! For New England Aquarium right whale researchers, this is one of the most wonderful times of the year: The Bay of Fundy field season! This marks our 33rd year of conducting right whale surveys and research in the Bay. Our 2012 team members hail from all over North America: Massachusetts, Vermont, Maine, New York, Washington, Ontario, and New Brunswick. Every day that the weather permits during the next two months, we'll head out on our trusty research vessel Nereid into the Grand Manan Basin right whale critical habitat in the lower Bay of Fundy. During a typical survey, we'll record counts of marine mammals and sharks, take photographs and record behavioral information of each individual right whale observed, and collect biopsy samples from specific right whales for our genetic database. And of course if we see a right whale defecate, we'll be right there with our pooper scooper to collect a sample for hormonal analysis! August 1, 2012. R/V Nereid waits patiently. 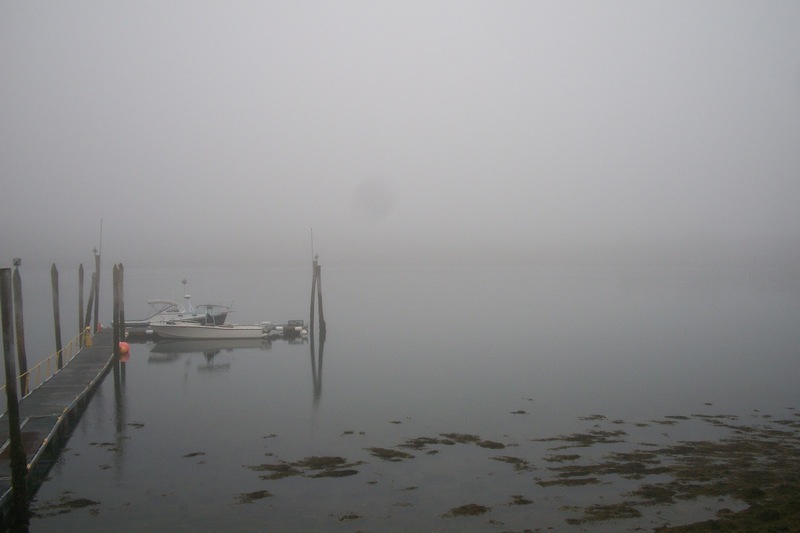 Due to a lovely combination of rain, wind and fog, we won't be leaving the dock today. In addition to the annual monitoring survey by the New England Aquarium team, our field station here in Lubec, Maine will also be home to a team from University of Massachusetts Dartmouth and Syracuse University. It will be this team's third year of collecting mother-calf pair acoustic and behavioral data in the Bay of Fundy, and we hope it will be a fruitful year for them! 2012 was a calving year of low numbers—seven calves were born into the population this winter, and we know that one of those calves did not survive. The Bay is popular with about 2/3 of mothers, so we should see several of these pairs this summer. Our monitoring surveys are supported by grants from Irving Oil (St. John, New Brunswick) and the Island Foundation (Marion, MA). 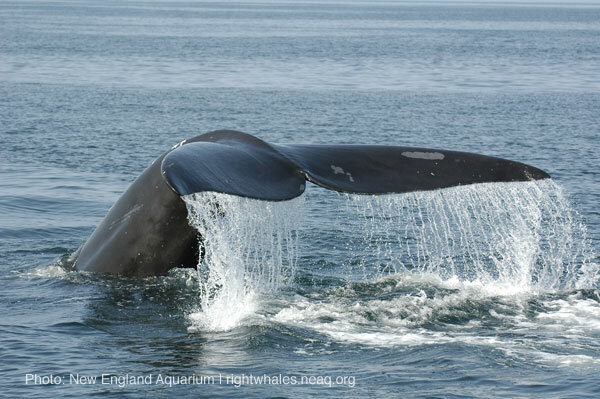 If you would like to support our research, you can make a donation by sponsoring a right whale! We hope you'll follow us this season on Twitter (#rightwhalescoop) and through our Facebook Group. Here's to another great season!